Posh goalkeeper Dion-Curtis Henry in action on his sole club appearance. Young Peterborough United goalkeeper Dion-Curtis Henry has been invited on a two-week trial at Crystal Palace. Henry (19) is currently third-choice ‘keeper at Posh behind on-loan Spurs player Luke McGee and veteran Mark Tyler. Posh forward Paul Taylor is out of contract at the end of the season. The teenager previously spent time on trial at Leicester City. He spent most of the first half of this season on loan to National North League side Boston United. Tyler is also out of contract. Negotiations are currently ongoing with a player who made his 496th appearance for the club last Saturday (March 18). It’s understood Tyler is keen on playing again next season when he will be 40. Posh goalkeeper Mark Tyler during his 49th appearance for the club. Other Posh players out of contract at the end of this season include forward Paul Taylor and midfielder Harry Anderson. 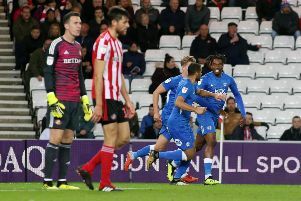 Posh have a two-year option on Anderson (20) which they are expected to trigger, but Taylor might struggle to have his one-year deal extended, even though manager Grant McCann remains a big fan. No definite decisions on player contracts are expected until the end of the current campaign.